Dubai Aquarium & Underwater Zoo is termed as the centrepiece of the famous Dubai Mall in Down Town locality of Dubai. For the reason that this leisure site has one of the biggest water tanks in the world that has pushed its name in the Guinness Book of World Record. More importantly this water tank has thousands of living marine animals in it, which includes dangerous sharks and stingrays as well. In brief, these aquatic animals are representing more than 85 different species of marine life. To make this aquarium more alluring for the visitors that builders of this leisure site have also made glass tunnel in this huge water tank through which people can come face to face with sharks, rays and other marine animals. The lighting system installed in this facility is also quite amazing, as it completely changes the ambience of this tank, depending upon the time of day. Aside from the tunnel, there is also an Underwater Zoo with this Aquarium, where visitors can witness penguin’s colony, giant catfish, dangerous piranhas, otters along with other species. Then there is a living ocean environment, rocky shore and rainforest too in this zoo. To experience all this Dubai Aquarium not only offers tickets on entry, but they also proffer membership card, gift vouchers and accept group bookings too. In addition to this, they have also made arrangements to provide information to their visitors through different programs such as Program Information and Teachers Information. This aquarium is build to top-notch standards allowing visitors to experience the exotic and magnificent aquatic life live in front of them. During this visit to Dubai Aquarium in the Dubai Mall, people get to enjoy breathtaking views, dining activities and options of leisure. Dubai Aquarium has also been able to register its name in the Guinness Book of World Record because of its huge proportions that have made it world’s one of the largest water tank. Visitors get to see over 33,000 living marine animals in this huge water tank, which belong to over 85 different species. This includes more than 400 rays and sharks all together. For close encounter with sharks and other fascinating aquatic animals, take a walk through the 270-degree acrylic tunnel of this aquarium, where a special lighting system called 'lunar-cyclic' will completely change the ambience of this huge water tank and make your trip an unforgettable experience. However, this lighting system mainly depends on the time of the day. Then there is an Underwater Zoo too in this leisure site, where ocean environment, rocky shore and rainforest are created. Here visitors will come across face to face with giant catfish, penguins, playful otters, dangerous piranhas and lot more. People can see this zoo from the bridge or reach out and touch some of the pool inhabitants. 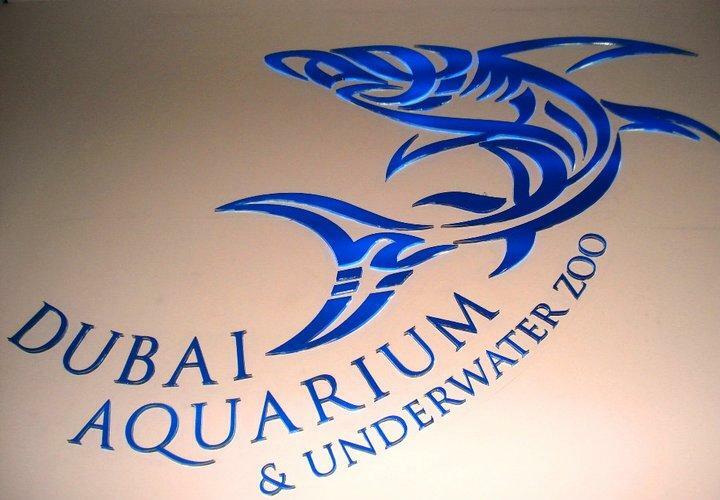 Visitors of Dubai Aquarium and Underwater Zoo are also offered underwater games. In addition to this, people can also book this place for organising events or birthday parties. Aside from this, regular shows and other activities such Shark Dive, Cage Snorkeling Experiences, Glass Bottom Boats and lot more also takes place at this venue. Burj Khalifa, Dubai Fountain, The Dubai Mall and Burj Khalifa Lake. The opening hours of Dubai Aquarium are from 10:00 am to 10:00 pm between Sunday and Wednesday, while last admissions in the tunnel are allowed till 9:45 pm and 9:00 pm in Underwater Zoo. From Thursday to Saturday this leisure site remains open between 10:00 am and 12:00 pm, whereas last entries can be made till 11:45 pm and in Underwater Zoo till 11:00 pm. Dubai Aquarium and Underwater Zoo charges ticket on entry that vary according to different packages offered by this leisure site. The combo ticket of Aquarium Tunnel and Underwater Zoo will cost you AED 50, whereas if someone takes Platinum Aquarium Package it will cost him or her AED 75, as it includes visit to Aquarium Tunnel, Underwater Zoo, behind the scenes tour and Aquarium gift shop voucher. This package is available between 10:00 am and 4:00 pm on daily basis. Then there is a Diamond Aquarium Package that comes for AED 85 and it includes tour of Aquarium Tunnel, Underwater Zoo, behind the scenes tour plus fish feeding and Aquarium gift shop voucher. The top package of Dubai Aquarium is called Ultimate Aquarium Package and it costs about AED 100. This package includes Aquarium Tunnel, Underwater Zoo, glass-bottom boat ride and Aquarium gift shop voucher. Dubai Aquarium & Underwater Zoo - The Dubai Mall - Dubai - United Arab Emirates. Head southwest from this metro station and then take a Sharp left toward Emaar Blvd. After that make a slight right towards Emaar Blvd, then take a sharp left turn towards Emaar Blvd, before continuing the journey straight onto Emaar Blvd. 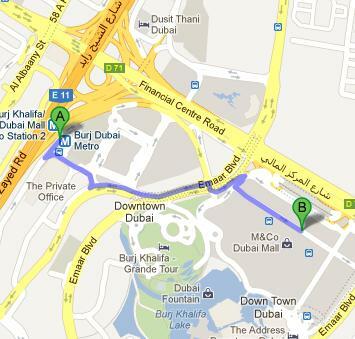 Later turn right and then make a left turn at Emaar Blvd in order to turn right afterwards. This will lead the patrons to a point from where they have to make a slight left turn and then a right turn in order to finally reach the destination that will be on the right side. Bus number F13 is the best way to get at the nearest bus stop of Dubai Aquarium that is known as Dubai Mall, LG Main Entrance 2 - The Dubai Mall, Dubai. The gap between these two spots is close to 76 meters and it can be bridged on foot in approximately 56 seconds. To so do bus passengers, who wants to reach Dubai Aquarium should head in the northwest direction after leaving this bus station. See map for directions.